While working with several companies on their monitoring systems, we learned about the needs of seniors and their caregivers. In this article we will present 15 design guidelines for making such systems more useful and easier to use. A senior’s caregiver wants to know whether the senior moves, sleeps, eats and drinks healthily. Medication needs to be taken on time, falls need to be detected and unknown people should probably not enter the senior’s home. But understandably, seniors do not want to have video cameras in their homes. Fortunately, several companies are working on telemonitoring systems that rely on relatively simple sensors, which can only detect abstract events such as motion. These sensors submit data wirelessly to a central system in the house and to a web server, where the data is analysed. Whenever something out of the ordinary happens, the caregiver receives an alert on her mobile phone. Table 1 shows some examples of such systems. The informal caregiver does not want to be disturbed during her normal job, unless there is something urgent. After work she may want to see more detail though. At the same time, the senior wants to remain in control and resolve issues herself before they are even sent to the caregiver. Therefore, it is crucial that the developers of monitoring systems carefully determine when and how alerts are presented. In this article we will present 15 design guidelines for making monitoring systems more useful and easier to use. We focus on systems that are at least partly meant for consumers, i.e. seniors living at home and informal caregivers. User interface for the caregiver? User interface for the senior? Table 1: Monitoring systems for seniors and their caregivers (not exhaustive). Night rest: when the senior did not get up, did not go to bed, or left the bed for an exceptionally long time during the night. There are many differences among the capabilities of seniors and not every caregiver will be interested in the same things. 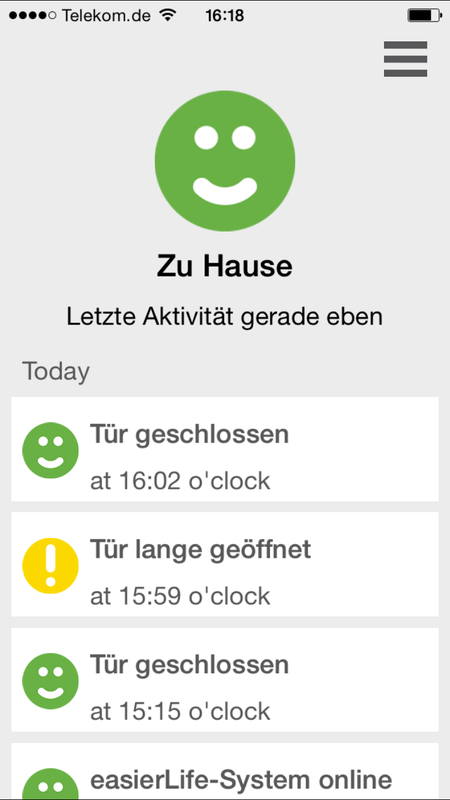 Therefore your system should allow the caregiver to switch the notifications for each event type on or off. Although it would be good for many seniors to move a bit more, most caregivers expressed that monitoring movement is not a priority for them. However, they do want to be informed when the senior stays in bed all day. Caregivers also want to know when the senior falls. Therefore your monitoring system should be able to distinguish between falls and a lack of motion. 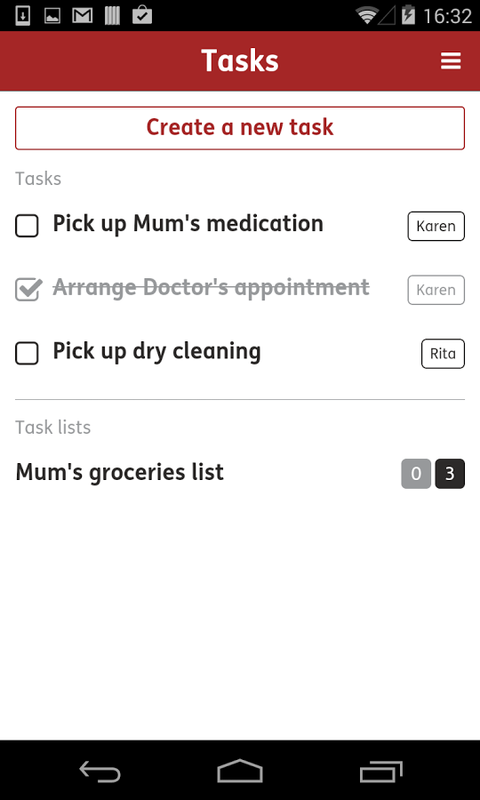 The Casenio system allows the caregiver to switch each type of notification on or off (screenshot taken in August 2015). Many of today’s monitoring systems immediately send their alerts to the caregiver, without informing the senior first. This is unfortunate. In many cases, the senior would have been able to solve the issue by herself. The senior now needs to pick up the phone, to hear from her caregiver that she did not close the door properly or forgot to take her medication. This is not just a disruption for both the caregiver and the senior, but it also makes the senior’s ‘failures’ public. Instead, your system should support the self-determination of the senior by first informing the senior about an alert. Only when the senior does not resolve the issue within a certain time, the alert should be propagated to the caregiver. This means that the senior needs to have a device at hand, such as a smartphone, tablet, or smartwatch, which informs the senior that a problem has been detected and how much time the senior has until the alert will be sent to the caregiver. Depending on the event type, the time for dismissing the alert may be different. E.g. when a fire is detected it should be much shorter than when medication intake is overdue. 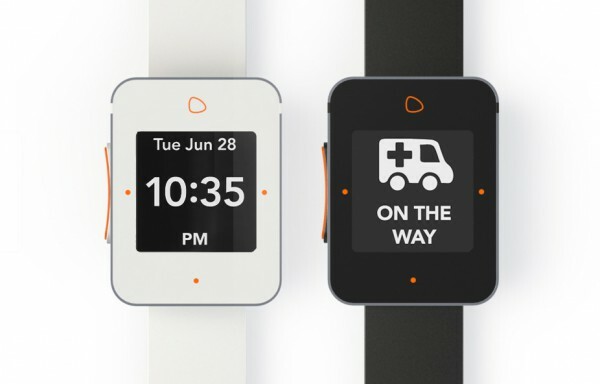 With a senior-specific smartwatch, seniors can not just make emergency calls, but also dismiss alerts. Image: Lively. Most caregivers will not rely blindly on the conclusion that was drawn by your system. Therefore, you need to allow the caregiver to build a mental model of the situation in the senior’s home. This means for example that it is not sufficient to say that the door has been open for too long. Rather, you should say since when the door has been open. You may even want to say if there was motion in the corridor before the door was opened. That way, the caregiver may be able to determine if it was the senior herself who opened the door (chatting with the neighbour? ), or if someone else entered the house. Alternative wireframes for a monitoring app. The left version does not provide sufficient detail. Make sure to add icons to the colours, because almost 10% of males have some form of colour blindness. Let’s say that the senior does not take her medication on time. The primary caregiver will then receive an alert, but may not be able to respond immediately. In the mean time, the senior may take the medication. In that case, your system should probably reset the alert, or rather: keep the alert, but create a new notification stating that the medication has been taken now. This way, the caregiver will no longer be anxious. Subsequently, the caregiver can decide if she wants to leave it at that or if she wants to talk to the senior to better understand what the problem was (simply forgot, out of medication, sensor damaged, notification settings to stringent, etc.). To conclude: your system should not delete the original alert, because that way, caregivers may never find out that there was a problem in the first place. 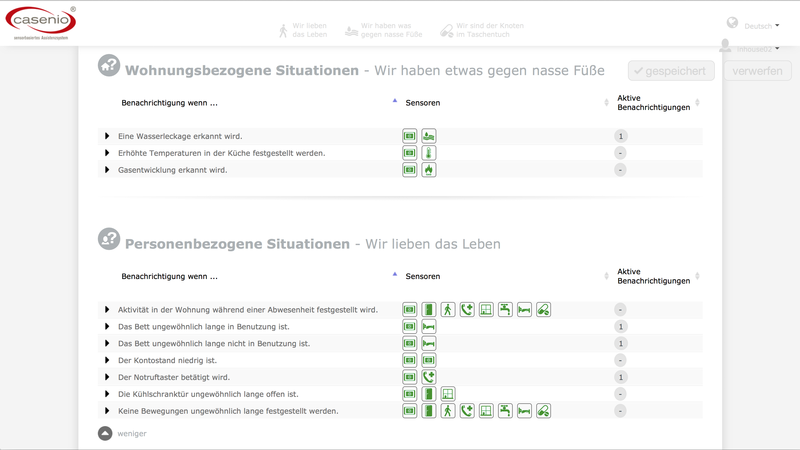 The easierLife system shows the history of events and does not remove alerts after the problem has been resolved, which is the right approach (screenshot taken in April 2015). The system is still in a ‘learning mode’ to determine what the normal behaviour of the senior is. In such cases, the caregiver needs to be informed accordingly. When components are not working, this deserves an alert, because high priority events may not be detected. 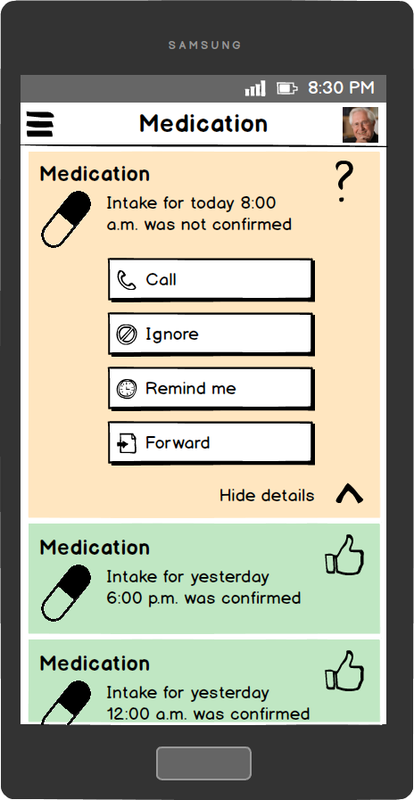 When there are visitors or when the senior is away, this should be shown in the caregiver’s user interface. When a sensor’s battery is about to run low, the caregiver needs to be informed as well, so that it can be replaced before the sensor stops working. Short away (e.g. gone shopping): In this mode, neither the senior, nor the caregiver should be required to tell the system that the senior has left the house. Rather, this should be detected automatically. When the senior is away for too long, the system should send an alert. Long away (e.g. 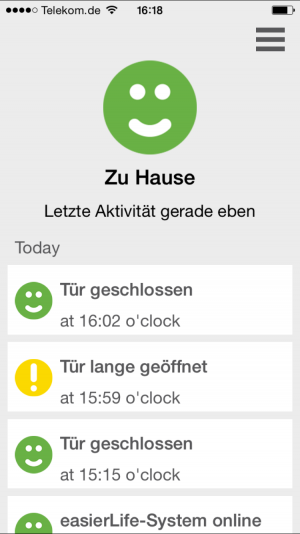 on holiday): In this mode, either the senior or the caregiver, but most likely the caregiver, will tell the system to pause notifications for a specified time. It should be possible to set the end date and time of the away period. Otherwise, it is likely that people forget to switch it off when they return and important alerts may never reach the caregiver. When seniors host visitors or own pets, monitoring systems may not be able to distinguish between the senior’s motion and the motion of another person or animal. Consider e.g. the situation where the senior fell, but a pet is moving. When the system believes that the detected motion is the senior’s motion, an important alert may not be generated. Therefore, your system must be able to distinguish between people and pets or at least be insensitive to pets. Another challenge may arise, when the senior can no longer safely open windows or use the stove, whereas a caregiver is allowed to do so. This means, that certain events should be ignored when a caregiver is present. Ideally, your system is able to identify people (e.g. using tags and beacons), so that it knows if it is the caregiver or the senior who triggered the event. This way it also becomes possible to identify unwanted or unknown visitors and create an alert. Moreover, these systems become applicable to the case where two seniors live together or where a senior lives in with another family. Your system allows the caregiver to specify an absolute timeframe. E.g. morning medication must be taken between 11:00 and 12:00, bed time must be between 22:00 and 23:00. Your system allows the caregiver to specify a typical time plus a tolerance time. E.g. morning medication will be taken at about 11:00, plus or minus one hour. Or: bed time is typically at 22:30 plus or minus 30 minutes. Technically these approaches are the same, but for the caregiver they may feel different. With the first approach it is pretty clear what the timeframe is. An alert will be generated when the event took place too early or when the event has not yet taken place when the timeframe passed. With the second approach it is essential that your system clarifies whether the tolerance time is added/subtracted in total, or if half of the tolerance time is added and half is subtracted. 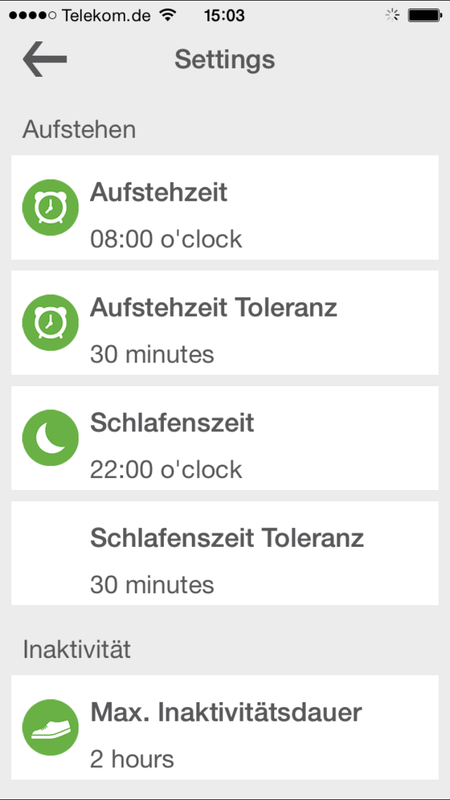 In other words: does 22:00 with a tolerance of 60 minutes mean 21:30-22:30 or 21:00-23:00? 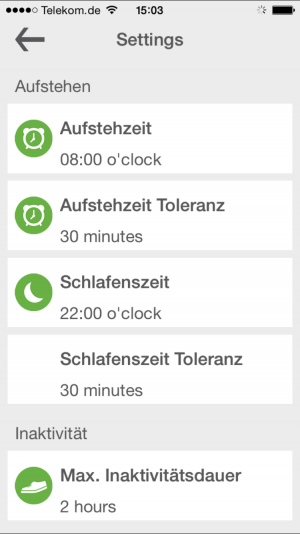 The easierLife system does not clarify whether the ‘get up time’ is 07:30-08:30 or 07:45-08:15 and whether the ‘go to bed time’ is 21:30-22:30 or 21:45-22:15 (screenshot taken in April 2015). Urgency of the alert: Some alerts are more urgent than others. The urgent ones (fall, fire, etc.) will need to be sent immediately, the less urgent ones (medication intake overdue, etc.) only when the senior failed to dismiss them herself and for the non-urgent ones, a weekly summary (in-app or per e-mail) might suffice. The caregiver should be able to change your system’s default urgency level for each alert type. Caregiver’s activity: When the caregiver is at work or asleep, she may not want to be disturbed. Probably, she will then put her mobile device in silent mode. Urgent app-notifications may need to overrule the device’s global sound settings. Caregiver’s technology: When the caregiver does not have the app installed on a mobile device or when there is no active internet connection to the app, app-notifications will never reach the caregiver. In those cases an SMS might be better. Call: The caregiver wants to call one of the important contacts. The senior herself should probably be the topmost option. Ignore: The caregiver wants to ignore the alert once or forever. Remind: The caregiver wants to be reminded again after a specified time, e.g. ‘in 5 minutes’, ‘in 30 minutes’, ‘in 60 minutes’ or ‘tonight’. Forward: The caregiver wants to forward the alert to a certain important contact and decide on the appropriate format, e.g. app-notification, SMS or e-mail. Offering these follow up options will not just make the system more useful for caregivers, it will also decrease the overall response time, which may save lives one day. An example of how your system could support caregivers to follow up on an alert. Most seniors have multiple caregivers. Those caregivers may find it challenging to know which care tasks have been completed by which caregiver. For example: should I do some shopping, or did the neighbour already do that this week? Therefore, you could offer functionality to allow caregivers to share information such as: tasks, calendar, medication and important contacts. 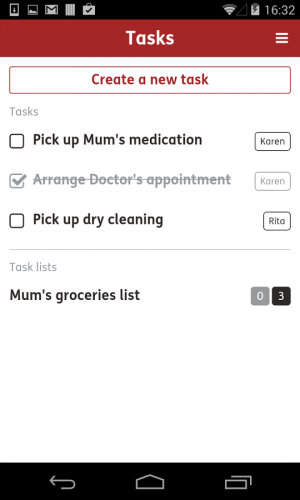 The Jointly app enables caregivers to share information such as: messages, tasks, calendar, medication and contacts (screenshot from April 2015). It is not uncommon for an informal caregiver to take care of more than one senior. Therefore, it should not just be possible to receive notifications from multiple homes, but it must also be easy to get an overview of the status of all seniors in one screen, without having to switch back and forth between the home screen and the screens with the individuals’ details. Caregivers would rather spend ‘quality time’ with the seniors than monitoring them, many seniors do not like to be monitored and both will get annoyed when your system generates many false alarms. If you want to make your system more useful or pleasurable, you should consider adding some functionality which makes it meaningful for their normal life. You can think of communication features, such as photo sharing or maintaining a shared shopping/wish list. Of course, this means that the senior needs to have a device, such as a smartphone, tablet or smartwatch. If your organisation doesn’t sell such products, it might make sense to partner with a company that does. 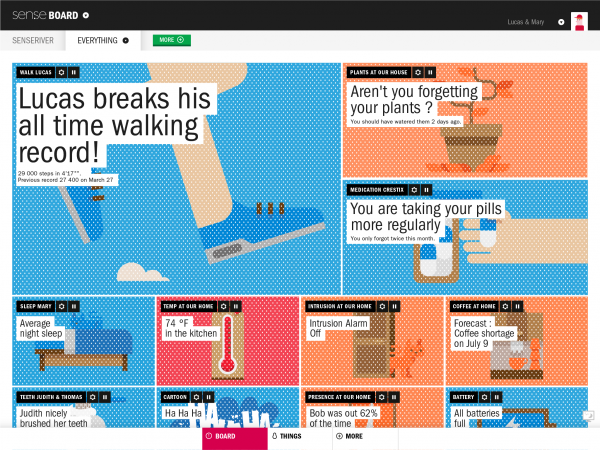 The Sen.se monitoring system has an attractive and somewhat humoristic user interface. However, this goes at the cost of clarity and efficiency, which may be more important for the case of elderly care. Image: Sen.se. Sell packages with sensors, e.g. ‘fall prevention and detection package’, ‘health package’, etc. This approach may be commercially attractive, but for the customer it offers less flexibility, because the number of sensors in a package is fixed. By offering a guided procedure consisting of several questions. Depending on the customer’s answers, the system proposes useful sensors. The customer can then decide which number she needs and add them to her shopping cart. Once the sensors are bought, it needs to be very simple to install them and to configure the system to work with them. Ideally, your system will automatically detect all available sensors and include them in the event detection algorithms, without any explicit configuration by the caregiver. 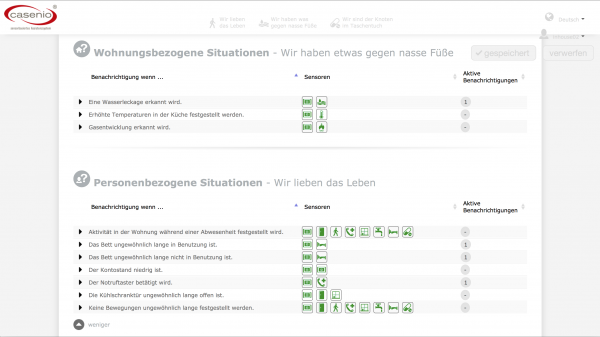 An example of a guided procedure for selecting sensors in a webshop. 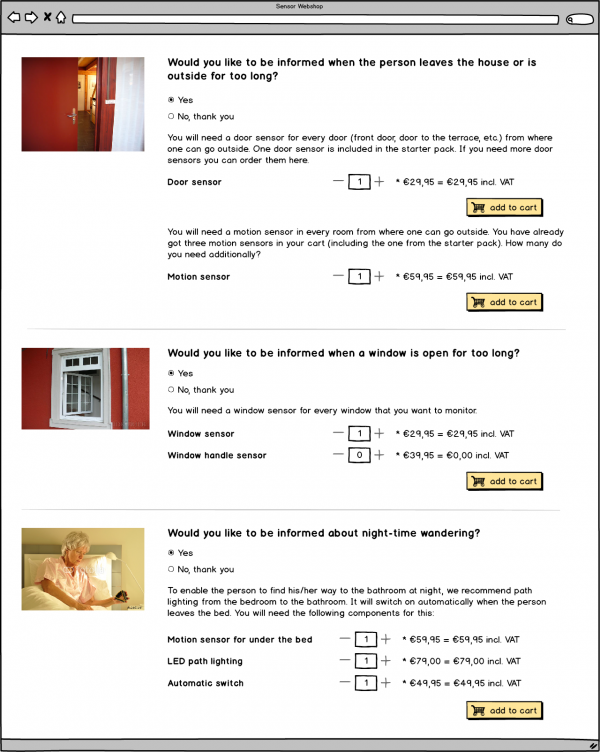 In this article we presented 15 design guidelines to improve the user experience of monitoring systems for seniors and their informal caregivers. For the caregiver, it is important that you get the number of notifications and the level of detail right. There should be sufficient information to build a mental model of the situation in the senior’s house, but at the same time, the amount of information should be minimal, to allow the caregiver to do her normal job, take care of her children, etc. For the senior, it is important to support her self-determination. In most cases she should be the one who receives the alert first and be allowed to resolve the issue before the alert is propagated to the caregiver.